As many of you who were here at last year’s AGM are aware, this was my first year as the Chair of the Fort Air Partnership. Previously, when I was vice chair, I focused on internal issues, but in the last year I started to do more external tasks, representing the Fort Air Partnership at a variety of functions. During this time I have gotten to know some of the different airsheds around the province. Each airshed in this province has evolved independently – each within its own special environment. As a result, the nature and scope can be quite different. Our airshed has a mandate to monitor ambient air and do related communications in and around Alberta’s Industrial Heartland. We report on measurements. We do not enforce ambient limits nor do we advocate for particular air quality levels. At the Fort Air Partnership, we have a strong industry component balanced by a strong public membership and augmented by government representatives from both health and the environment. While we certainly come at problems with different viewpoints, the group is able to resolve issues in a collaborative fashion. Over the years, thanks largely to the leadership of the previous Chair, we have been able to develop relationships of trust and respect that allow us to move forward on difficult issues. We benefit greatly from the industrial participation in our airshed because many companies have highly qualified environmental personnel who are familiar with the types of issues that occur in air monitoring in this region. Several of these individuals (through Northeast Capital Industrial Association) participate in our technical working group, assisting us with things like selecting the best equipment, trouble shooting technical issues, and preventing other problems. Underlying this interaction are companies’ employees working in a positive, cooperative manner with members of government and the community under the FAP umbrella. Sometimes people ask why aren’t all airsheds the same? Airsheds have evolved to meet the different needs of the communities that they are in. We, for example, have an industrial base that is highly localized and expanding rapidly. 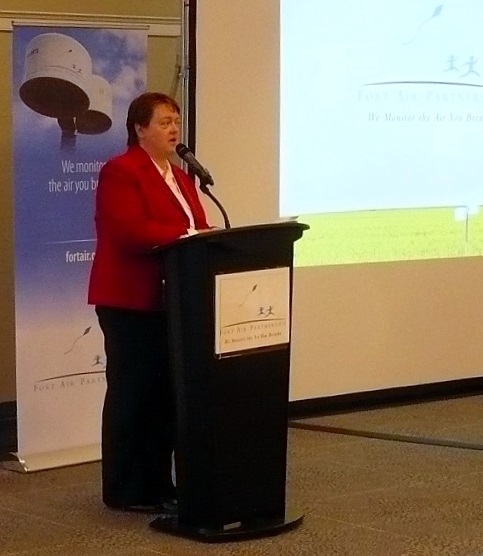 Communities such as Bruderheim and Redwater are on the edge of this expansion and want to be sure that the air in their community will continue to be good. But it is not enough to say the air is good. People must know and believe that the monitoring and reporting we do is accurate and unbiased. Here is where the credibility of the Fort Air Partnership comes into play. Decisions made by our multi-stakeholder group are balanced, not dominated by one group or the other. Our audit results and satisfaction ratings from stakeholders and the public illustrate we are credible and our airshed model works. ­Continued access to a broad range of expertise and resources. ­Retention of local, multi-stakeholder involvement that garners hundreds of volunteer hours. Ensure everyone’s voice is heard and that there is buy-in from all stakeholder groups involved, including a very strong public voice. Stay connected to the community. Report local data to local people and encourage public inquiries. This makes us credible to our stakeholders and the public. We are fortunate to have AEMERA’s CEO Brad Pickering here tonight to speak to us about the new agency and how it will impact airsheds like ours so I won’t spend any time speculating on what impacts the new agency may or may not have on us. Hopefully, Brad will share some insight on that. I’d like to close by thanking Board and Committee members, staff, volunteers and contractors for their tremendous dedication and hard work during the past year. It’s their commitment that makes us, in my opinion, the best airshed in the province.